The change in the weather certainly affected work at Hanwell but then so did the start of the new academic year at Oxford. Trips down for a variety of induction meetings and a round of very valuable introductions have taken up several days. 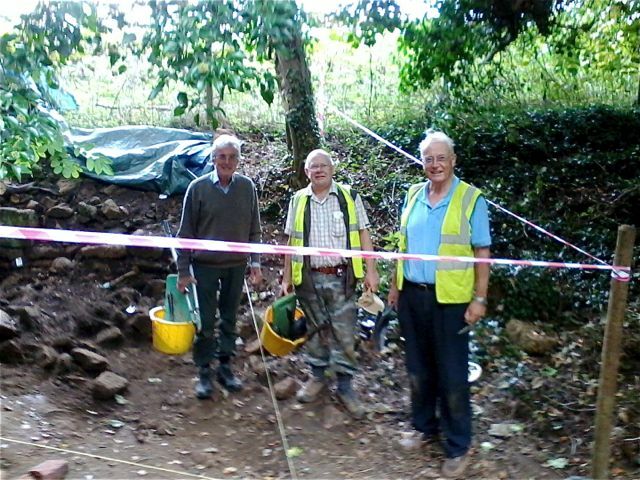 Work has continued in an off and on fashion down on the second sluice with the usual stalwarts turning out to shift rubble. This process is gradually defining structures although precious little of it is looking sluice like. The team all looking remarkably hale and hearty. 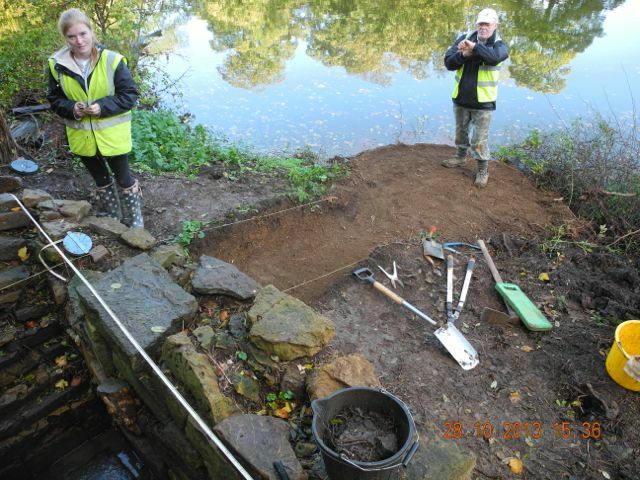 Work on the lake-side sluice is nearly finished. Plans and elevations of the stonework are pretty well complete although there is still lots of section drawing to do. The plan is the produce a first interim report on the archaeological work at Hanwell and have it in print before Christmas. A slight rise in water levels has enabled us to return to the House of Diversion, again lots of drawing being done. 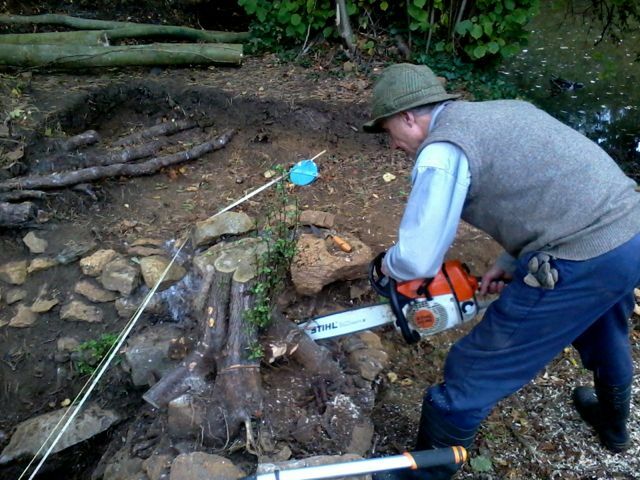 Christopher was kind enough to help clear some more of the unwanted growth and in particular use his chain-sawing skills to edit out an especially troublesome hawthorn root. 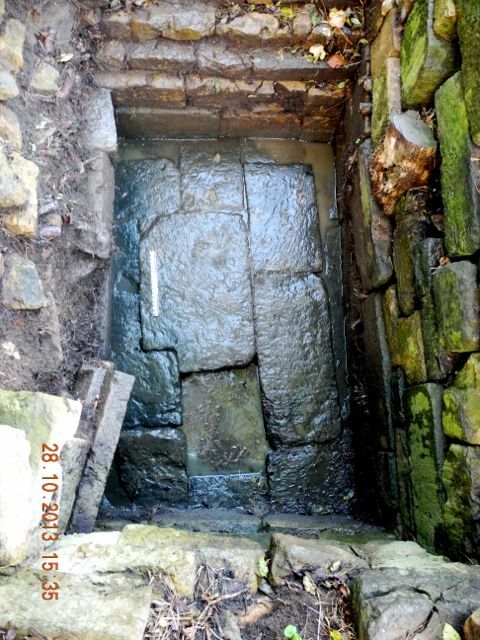 The flight of 'fairy steps' on the north side of Sir Anthony's Bath, can they really be steps? Christopher helps us discover with a little tree surgery. 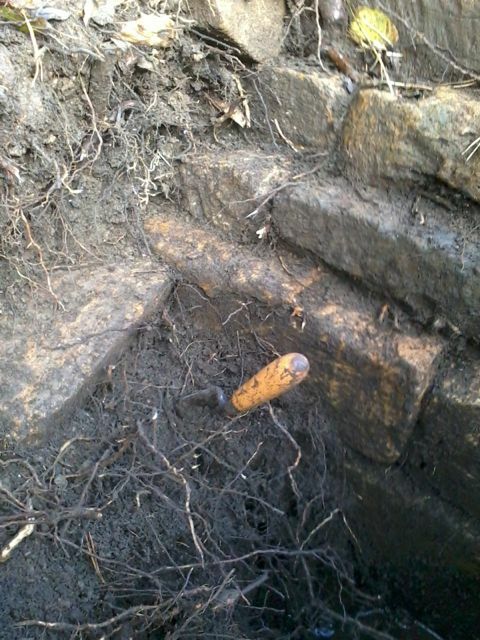 It's funny how a single stroke of the trowel can push the story of a location back several thousand years. 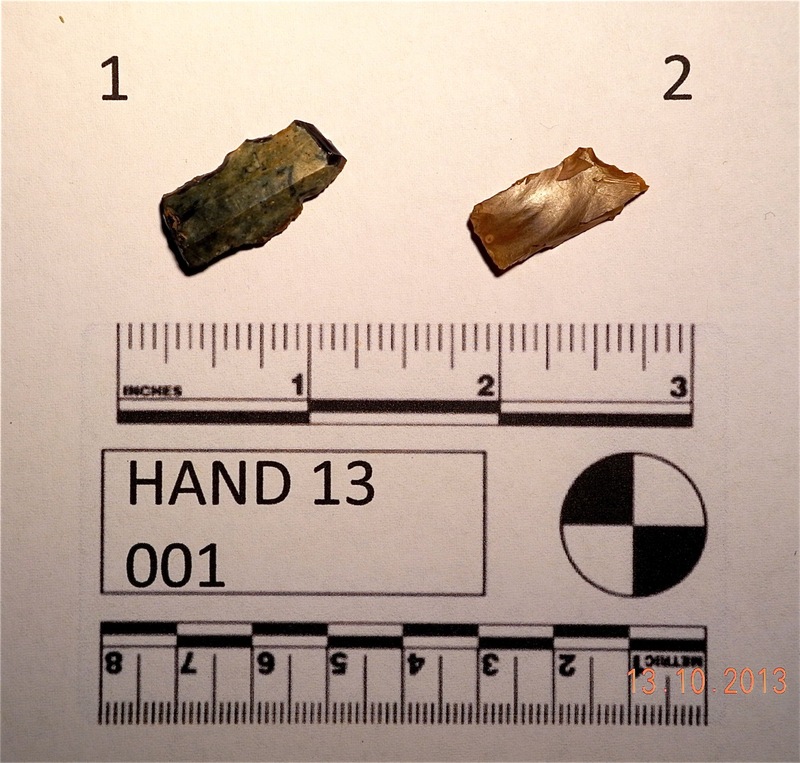 These two flint blades found amongst the topsoil around the second sluice are from the neolithic or even possibly the Mesolithic periods which could make them up to 10,000 years old. They are clearly redeposited and may have eroded down from the valley side to the north. The first blade, trapezoidal in section, was struck from a very glassy fine black flint, almost obsidian like. Interestingly it has the beginnings of a creamy patina but then bears evidence of later breakage or even possibly reworking, at either end and along one edge. 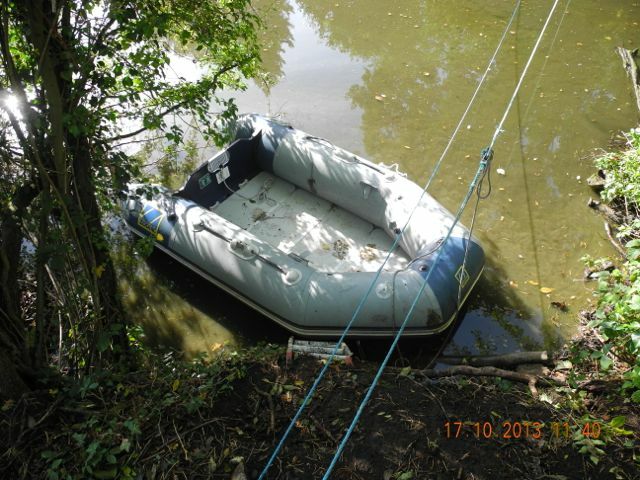 As the trees became progressively more spectacular and autumn got well bedded in our prospects for successful navigation round the Lake improved enormously with the arrival of the good ship Zodiac, a bigger, better inflatable with a rigid base and vastly improved stability. It is a vessel that one can actually work from rather than just survive in. Many, many thanks to the friends of Christopher and Rowena who donated it to the cause. And here she is, I'm afraid she's already starting to accumulate a coat of mud. Access to the island continued to improve following a day or two of heavy rain. A few intermittent fine days enabled us to finally bottom out the the bath. I really felt for all those volunteers who over the summer months have played a part in removing what was in effect just one tangled mass of roots yet missed out on the final exciting stages. When the end came, it came fairly rapidly. Occasional probing had convinced us that there was up to half a metre still to go but what we hadn't allowed for is that by chance our chosen probing spot was above a sump. The final few centimetres of fill came away easily, although not cleanly, as by this stage the deposits were pretty liquid. The job half done, the pattern of flagstones is just starting to emerge... and 40 minutes later we have pretty well the whole thing, you can see the sump to the right. 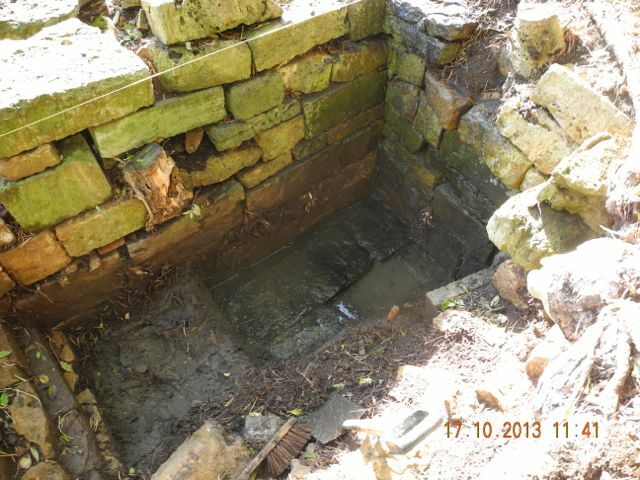 Despite our best efforts it became clear that the fill of Sir Anthony's Bath was not only a single deposit but it was almost entirely devoid of finds. Looking around I noticed a block we had first seen on our initial visit to the island parked by the northern edge. 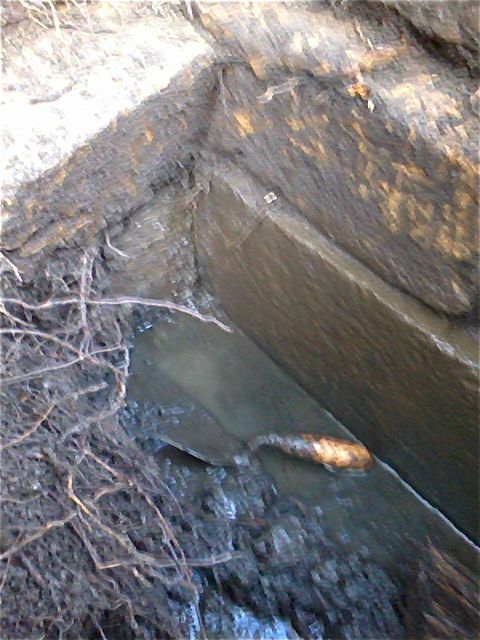 It is a perfect fit for the existing space where the sump is. 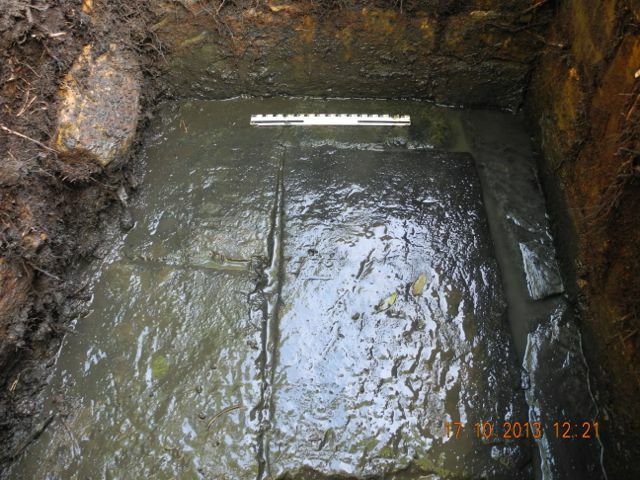 I think the conclusion must be that the whole bath was dug our fairly recently and this block removed from the bottom, probably to improve drainage. 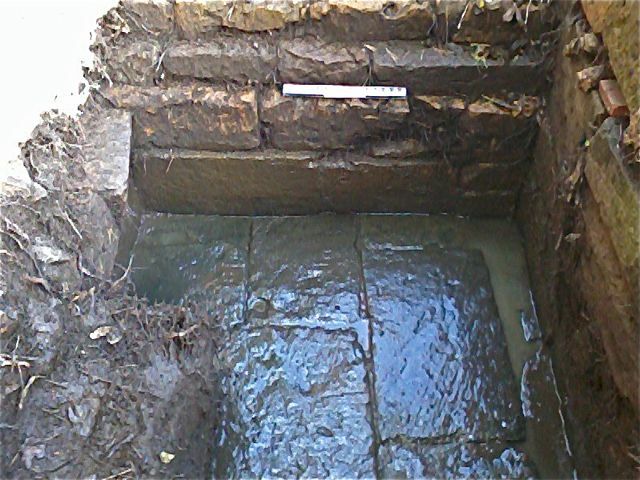 Here is the stone as first seen back in January, only slightly overgrown, and here it is cleaned up and measured, a perfect match. 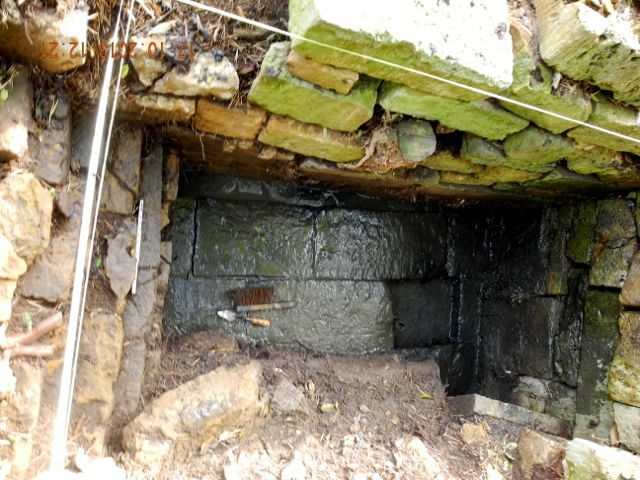 The base revealed: the south end plus gap and the north end facing towards the steps. 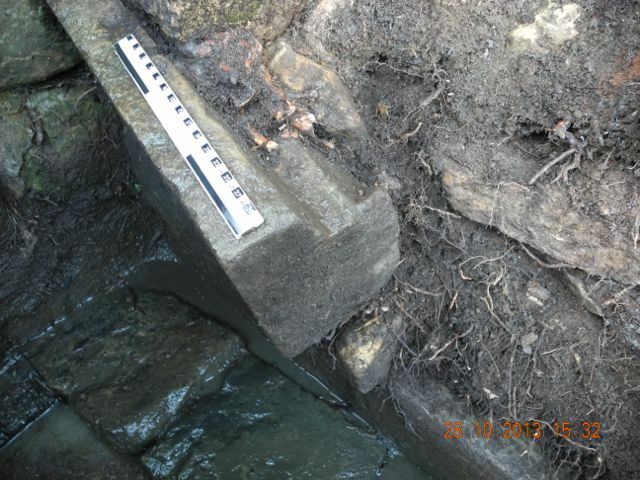 Although there is still some work to do along the western edge where the surviving rubble core is quite unstable we can begin to record a few observations and venture on one rather unsettling suggestion. The first point to make is that there is a significant difference in the character and quality of the basal stonework compared to the walls. 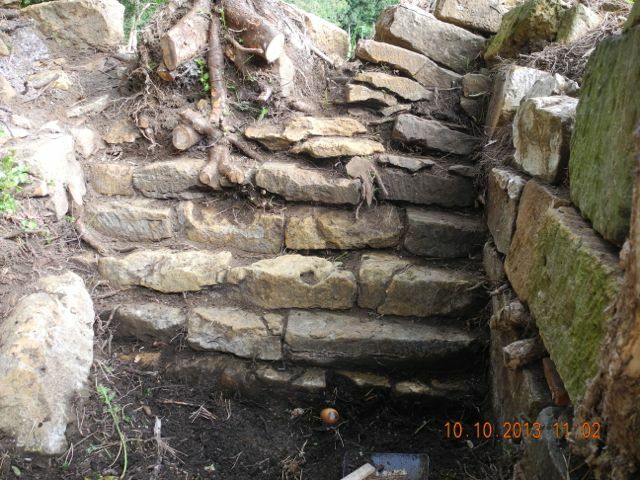 Whilst the walling is made of ashlar it is not particularly regular and the whole thing, even allowing for root disturbance, looks slipshod, and the steps are, of course, a joke. The flagstones represent a much more solid kind of construction. Then we have the question of alignment. The coursing of the floor is out of line with the east wall by around 5 degrees. 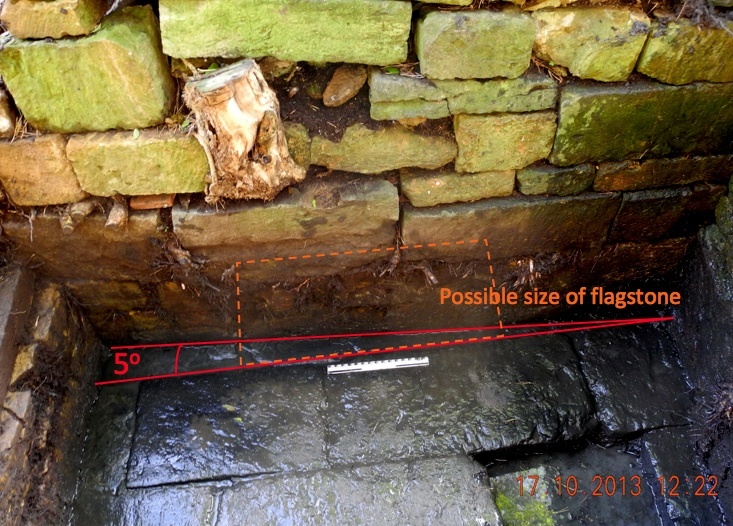 This could be carelessness, but the flagstones are fairly consistent in width at around 36 cm. If the ones which are just peeping out from beneath the side wall are of a similar size there is an awful of of stone wasted, similarly at the ends. 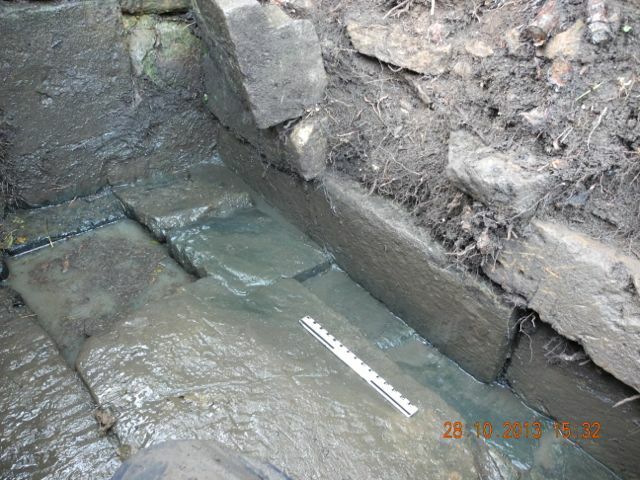 In fact the whole thing looks as if we have the side walls simply dropped down onto an earlier surface. Now here's a further disturbing observation. The flagstones are bedded down onto a thick layer of blue/grey clay. 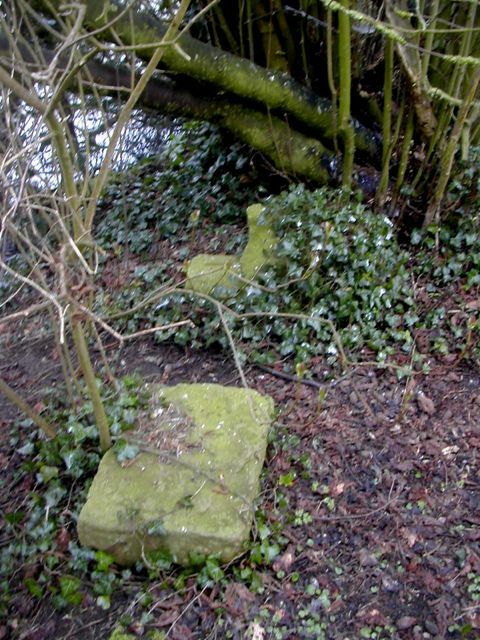 We have already noted the presence, at about the same level, of an area of broken stone slabs which surrounds the island. These too are bedded in the same kind of clay. 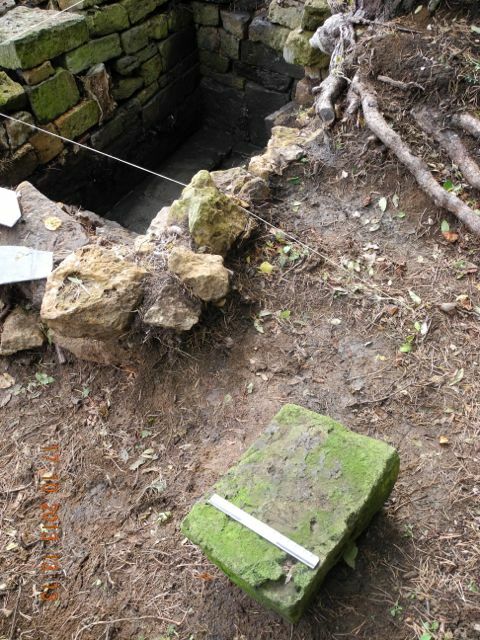 Could it be that in the seventeenth century the level of the water in the lake was significantly lower and these flagstones are in fact the original paved surface associated with the House of Diversion? This would suggest that the bath is a later construction founded on and perhaps built from the ruins of the seventeenth century marvel. This could all add up to a powerful argument for draining the Lake next year to enable further investigations to take place. It's a huge contrast to shift from sloshing about in mud to sloshing about in manuscripts but that is kind of where I'm at at the moment. It was clear from the outset that the archaeology would only make sense with back-up from some heavy duty history. This effectively began with what feels like an archetypal Oxford experience. Thanks to the good offices of Rowena I was fixed up with an appointment to meet the near legendary figure of Cliff Davies, Wadham College's archivist since 1963... just pause for a moment to take that in. Why Wadham? Well there are a few intriguing connections. First of all we have a newly appointed warden of Wadham, John Wilkins who took up his post in 1648. 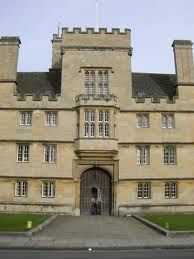 The following year sees Sir Anthony Cope arriving at Oriel College and it seems probable that a family connection would have been recognised. 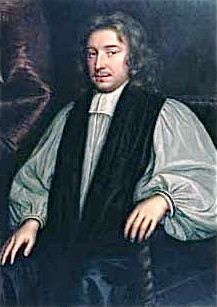 Wilkin's grandfather was John Dod the puritan cleric who was appointed to the living at Hanwell in 1585 by Anthony's great grandfather, the first baronet. 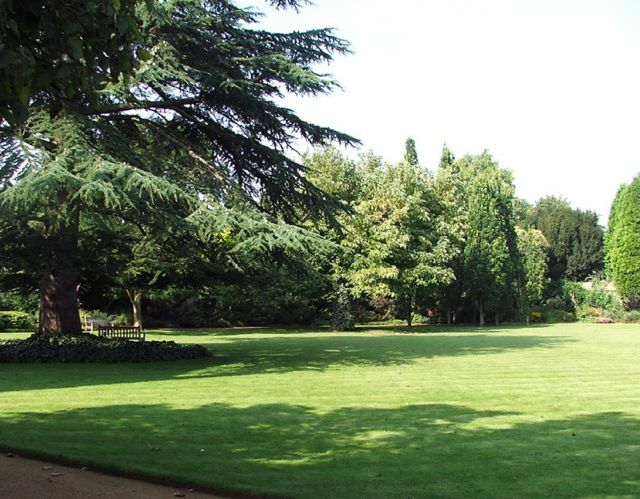 Now one of the features of Wilkin's wardenship that he is famed for was his development of the gardens at the college. Given that part of the Civil war defences of Oxford passed through the college grounds one suspects that it would all have been a bit of a mess but Wilkins not only takes on the construction of a fashionable garden he also fills it with mechanical contrivances reflecting his own interests in natural philosophy. Surely Sir Anthony would have seen some of this work in train and perhaps have been inspired to at least contemplate developing his own gardens along similar lines. 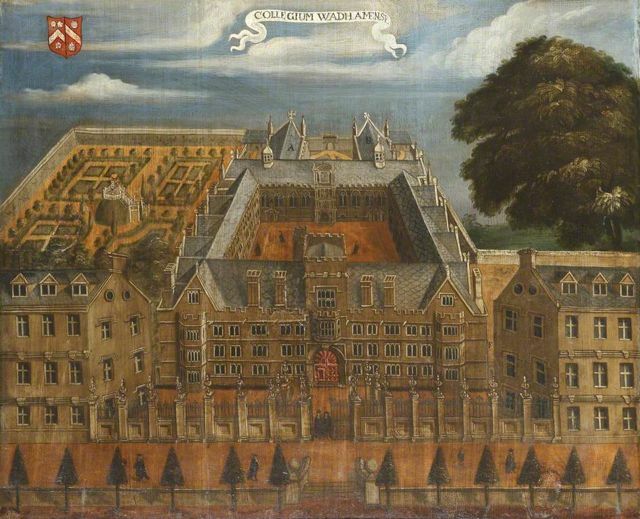 Then, of course, we have the famous concert given in the warden's lodging in 1658 or 59 by Thomas Baltzar and a final possible connection, could Wilkin's have shared his interest in cryptography in a clandestine sort of way with Richard Allestree? This is why I shall be immersing myself in the Wadham College archive, a process that involves steep twisting wooden stairs and chambers tucked away under the eaves of the west range of the Front Quad. Who knows I may turn up Christopher Wren's bar bills. Wilkin's garden is to the left of the Front Quad. Well C. Wren's bar bill wasn't terribly much in evidence but in 1652 he is recorded as being 5 shillings in appears with a payment to college. One might assume that every document in Oxford must have been studied to death yet those accounts referring to garden work at Wadham do not seem to have been published before. Despite having a lot on in Oxford we did manage to get a little more done as the month wore on. 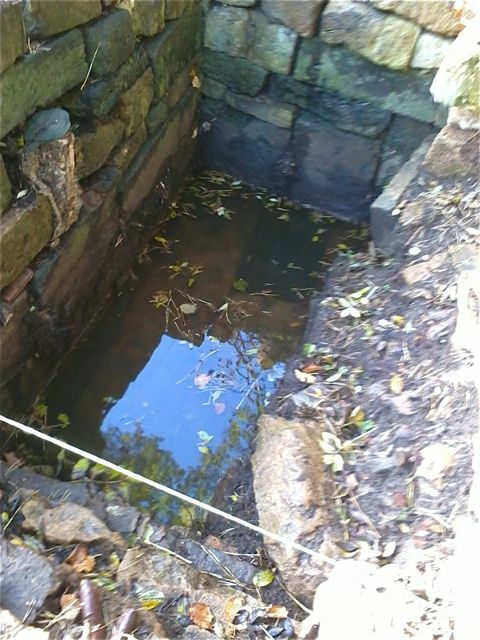 Returning after a couple of days of quite heavy rain the name Sir Anthony's Bath' gained a small degree of plausibility as it had accumulated 15 centimetres or so of water. 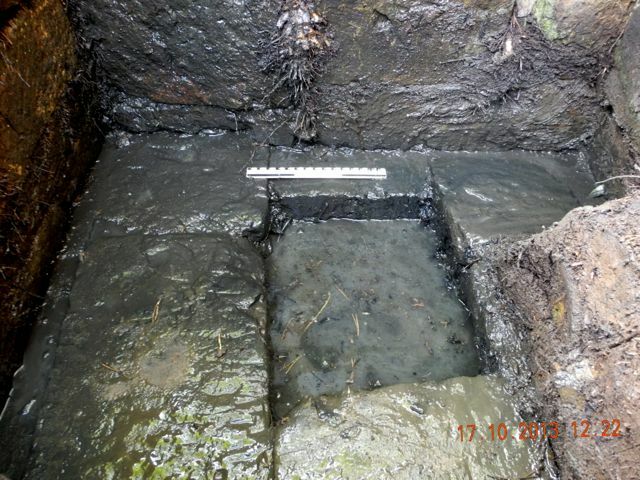 Once bailed out we were able to shift the matted roots from the last remaining unexcavated corner revealing the full extent of the northern side. Hmmm... water. Roots. More roots. The last week of the month was half term and saw the arrival of the 'Big Dig' week. Well Monday wasn't particularly big. A few people had study commitments or transport difficulties but Isobel came up from the far south, the fabled land of Guildford I believe, and Peter made a welcome appearance and all went swimmingly. Whilst the south of the country was being wracked by storms we enjoyed an very pleasant day with only a couple of passing showers. 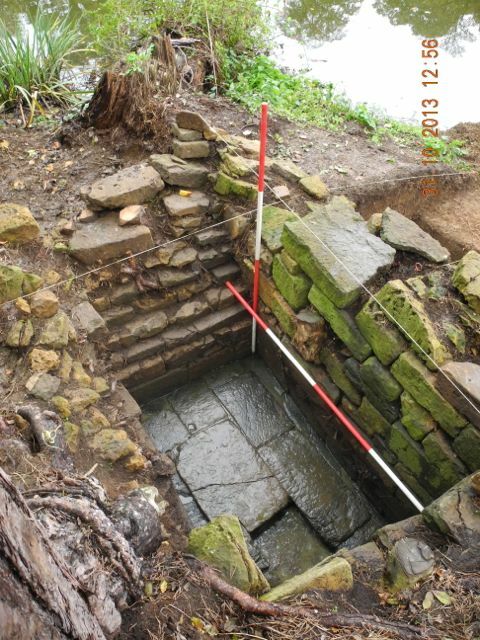 We were able to completely excavate the base of Sir Anthony's Bath and begin a metre wide trench on the east side to test the idea that the paving at the base of the Bath originally covered the whole island. So here is the western side fully excavated with the lowest course fully preserved. And here is the detail of an architectural fragment reused in the west wall and now pushed wildly out of place, still it seems firm enough. The full extent of the Bath revealed. 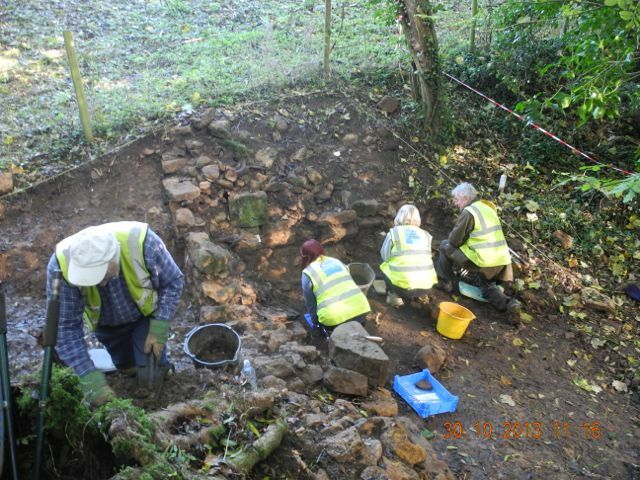 Work also continued down the valley on the second sluice. We spent some time examining an area of crushed rubble which almost looked like a kind of hard standing, perhaps of a yard, but didn't quite make it. 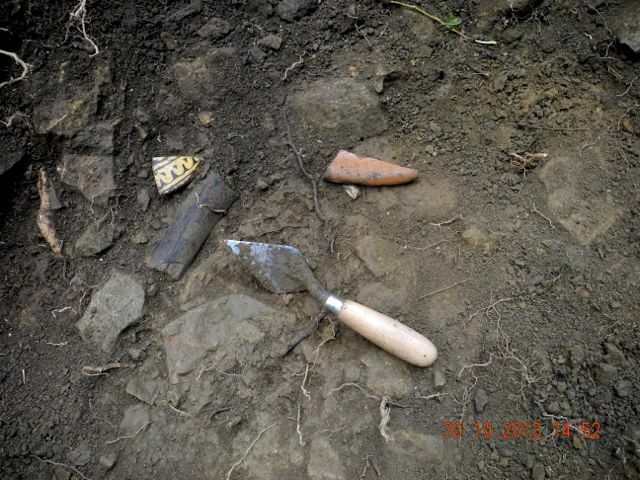 Despite some very nice seventeenth-century slipware and other bone and pottery fragments lying on the surface it still didn't add up to a floor. Not a sight seen very often at Hanwell, a traditional line of trowelers... and the fruit of the their labours: pottery and bone. ... and then it all fell apart, sort of. The thing was we decided to check up on the theory about the wider extent of the flagstones underneath the island as a whole. 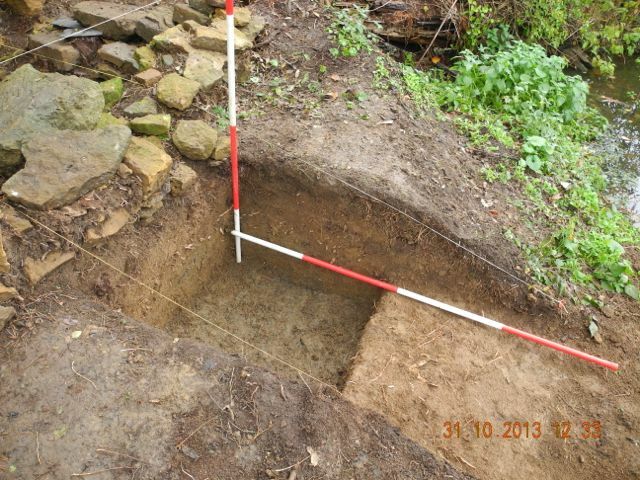 In order to do this we put a mere wide trench down outside the wall to the east and we went down and down and down until we hit thick blue grey clay which went down and down for at least another half a metre, we augered it, no flagstones. So back to the thinking step on this one. Isobel looks concerned while Peter checks to see if he's on over-time yet. 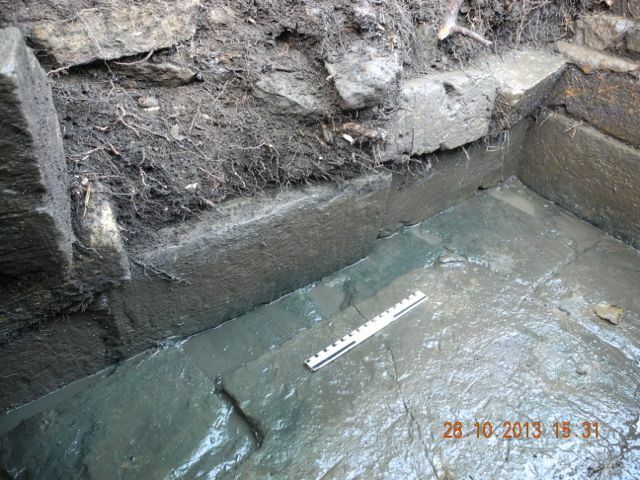 And here's the finished trench with blue/grey clay at the bottom. Before closing down for the winter on the island we cleaned up, took some further detailed sets of photographs and completed drawing up the plan, elevations and sections.